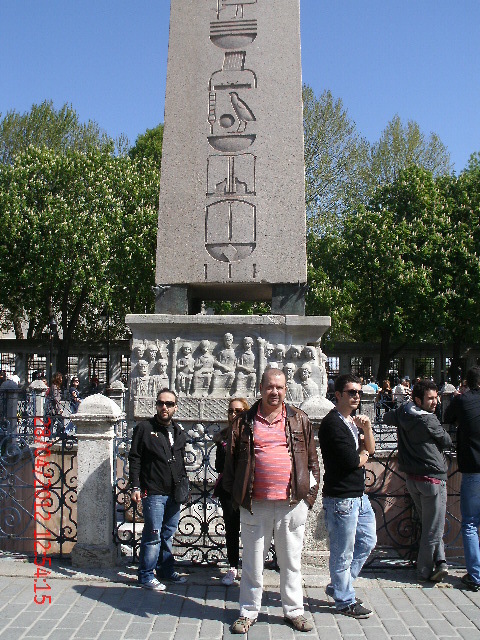 I had always wanted to go to Istanbul and finally made it this year. It was everything I expected but much better and much, muchmore. It is a glorious city with glorious people and I will definitely visit again. 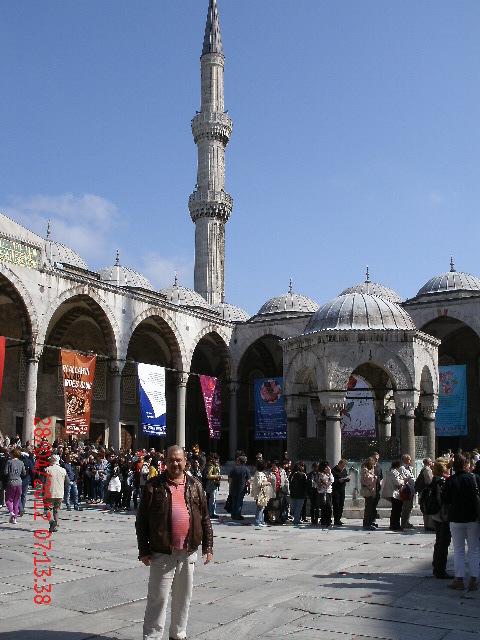 I travelled with best friend of 17 years Nabil and he felt the same way about Istanbul as I did. 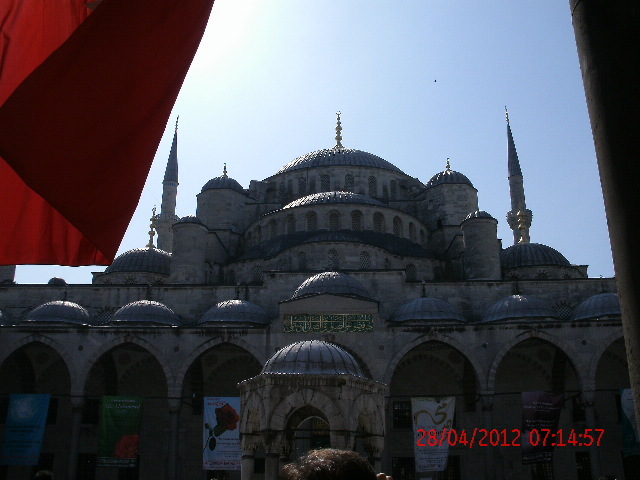 We travelled from Heathrow on Friday April 27th on Turkish Airlines as I wanted the full Turkish experience. We ended up getting into Istanbul 2 hours late but these days and after all my years working as a travel rep I know 2 hours is nada. We arrived at Atatürk International Airport and didn’t realise we had to join a Visa queue before joining the Passport Control queue which we did so, we had to go pay our £10 at the Visa desk and get a lovely colourful sticker in our passports and join the Passport Control queue again…but no matter. The luggage came through quickly and then we met ‘John’ who was arranging transport to hotels. We hung around and eventually got into a mini-van arranged by our hotel. We shared with 5 other people who had flown in from Zagreb but we were the first to be dropped off. 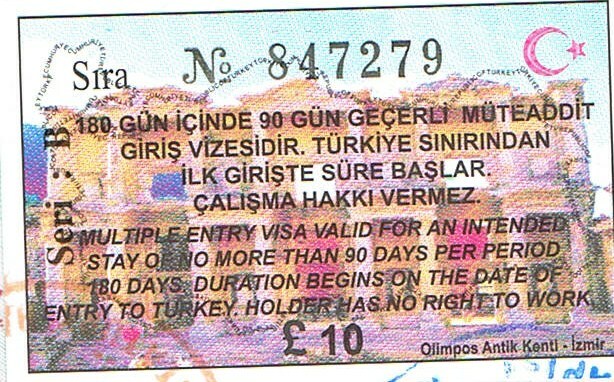 We had been worrying about tips, as you do, and eventually gave the driver 10 Turkish Lira (TL) which was just under £4. After all – the ride was free. 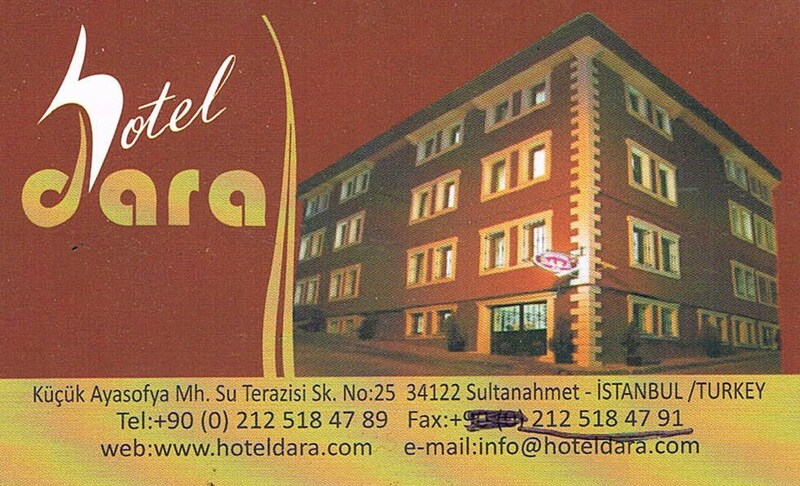 We arrived at the hotel I had searched and searched for online for days, maybe weeks looking at Travel Advisor traveller reports – it seems there are ‘trolls’ out there who deliberately write bad reports for all hotels/ restaurants, etc – usually other hotels, restaurants, etc – and I finally decided on the 3 star Hotel Dara in the historical area of Sultanhamet. We were warmly welcomed and shown to our rooms. Mine was Room 36 whilst a lovely room proved to be very noisy. However, it was well-appointed with all the mod-cons of wi-fi and TV (if you understand Turkish – Nabil found Al-Jazeera in English on his TV but I didn’t and didn’t really have time or the inclination). Everything was very clean and cleaned daily with fresh towels every day too. It was very small however but adequate – you just had to adapt to the dimensions especially in the bathroom. There was also a safe in the room which was free of charge. Nabil’s room was right below mine and was Room 28. His was a little less noisy than mine. Mine was noisy because after Morning Prayer just before sunrise the birds went mad – it was like some kind of fist-fight or should I say wing or beak fight going on outside my room only with birds about5/5.30am. When this quietened down I would hear right above my room the breakfast-terrace being prepared which was very noisy. The first night I imagined some mad old woman banging a plank of wood against the fire escape because it sounded just like that ☺So, I didn’t really get enough sleep whilst there even though we had early nights. As we dumped our bags and organised our rooms and prepared to go for a walk and explore we heard rain pelting down outside – not a good sign. But, I had checked the weather forecast and rain was predicted and only predicted that day – the rest of our stay was predicted as sunny and about 70 F/20 C which was perfect. And, we got that weather – I think, in fact, we had a few more degrees with it being a little chilly in the evenings which we expected in April and it was much better than back here in London too! On our way out we spoke to Aytac (he said pronounced as ‘High Touch’) and he told us how to get to the Hippodrome and Sultanhamet Square which were about 5 minutes walk up the quite steep cobbled hill from the hotel. We entered the Hippodrome which used to be a huge arena that had fantastic chariot racing and was laid out in the 3rd century AD and the stadium held up to 100,000 people. This was also the scene of a brawl in 532 AD between rival chariot-racing teams which developed into the Nika Revolt that destroyed most ofIstanbul at that time. Now, it’s very peaceful with gardens and places to sit and relax and the Egyptian Obelisk built in 1500 BC which came from Luxor (this apparently was only a third of the original height of the Obelisk) and part of the Serpentine Column built in 479 BC and shipped from Delphi and the weathered Column of Constantine Porphryogenitus (yes, you try pronouncing that!) – was restored by Emperor Constantine in the 10th century AD (remember Istanbul used to be called Constantinople after this Emperor). 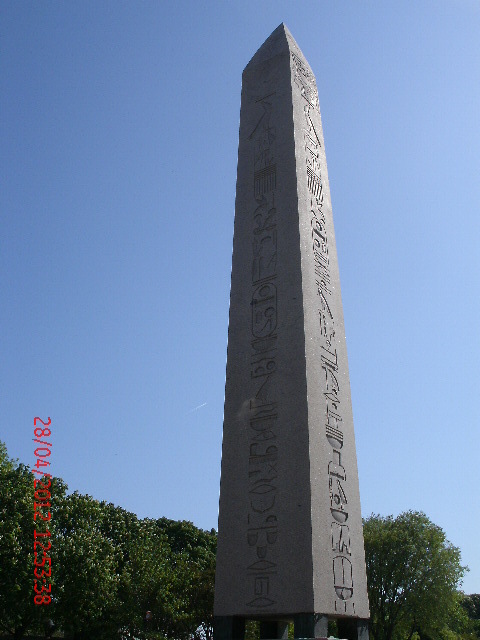 It looks weathered now because young soldiers called Janissaries used to show-off scaling the column showing how manly they were. 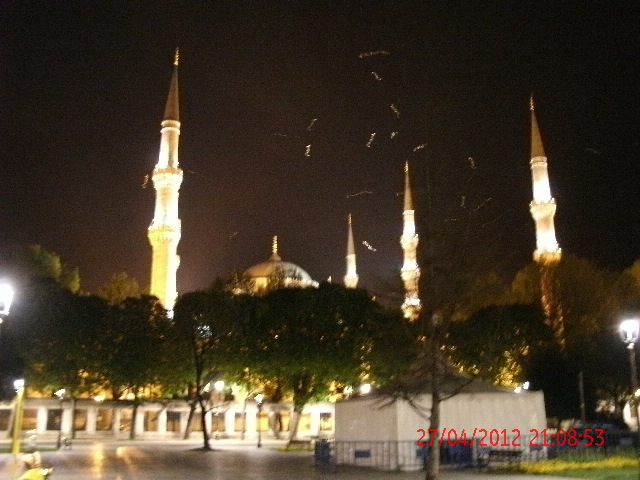 As we entered the Hippodrome the sight that knocked you sideways was that of the Blue Mosque – wow! – what a magnificent sight! The photos I took do not do it justice. We were seeing it for the first time in the evening light all lit-up with its magnificent 6 minarets and lots of seagulls swirling around them making it even more dramatic as if it wasn’t dramatic enough! We saw people walking in a side-door and decided to follow as they looked like tourists like us. We entered the courtyard and I managed to get a photo before a guard told us it was now closed. We left in search of sustenance and libation. We walked along the remains of the Hippodrome towards Hagia Sofia the once huge church but subsequently turned into a mosque and famous – to me at least – for having appeared in ‘From Russia with Love’. It is now classed as museum and not used for worship. We walked amongst restaurants, cafés and bars and this was one of the annoying things about Istanbul (and certain other places too) is that they try and entice you in to each and every joint and being terribly British I just tended to say no and moved on. If I hadn’t had all these approaches I may have at least had a look at the menu. But you have to adapt very quickly as it is their custom and not mine. We walked past a bar where we were approached and then decided to return as a beer was needed. This was my first beer in just over 5 months! It wasn’t terribly busy because it had rained that day and even that evening so, we sat inside and ordered two Efes beers; tried to learn a little Turkish with the bar-men and then after much discussion about tips which got nowhere so we didn’t bother we went to dinner. Around the corner was a cluster of lovely looking restaurants from which we had to choose and we had a delicious first Turkish meal in Turkey. The next day was Saturday April 28th. The breakfast buffet had endless variety which no-one could balk at. And, you could eat as much or as little as you wanted. Nabil went for the first option; I went for the second option ☺ So, there we were sat on a terrace inIstanbul,Turkey eating breakfast and looking over the Sea of Marmara! Wow! 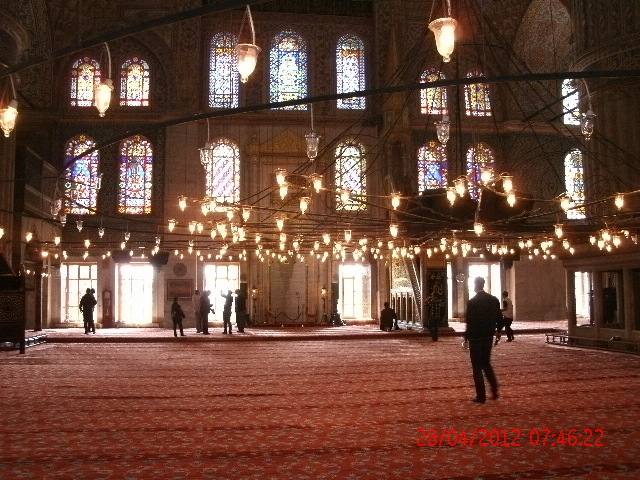 After breakfast we set off to the Blue Mosque which we had visited the night before. I had tried to be efficient and research where the entrance for tourists was but took us the long way around but it was an interesting little tiny backstreet we walked down anyway. We arrived to find queue a mile long but the weather was lovely about 70 degrees and we bobbed in and out of the queue afraid of losing our place but just left to take photos and actually just joined wherever we were stood each time. Not really pushing in because we had been there all along. It may have been 45 mins to an hour to queue. We finally reached the entrance and entered through a very narrow arch which was the bottle-neck for the crowds or it controlled the amount of people who could enter so, no bad thing. You have to take off your shoes at this point and plastic-bags are provided to put them in. Men should not visit in shorts and women should not have bare shoulders, etc….no different to St Peter’s inRome. 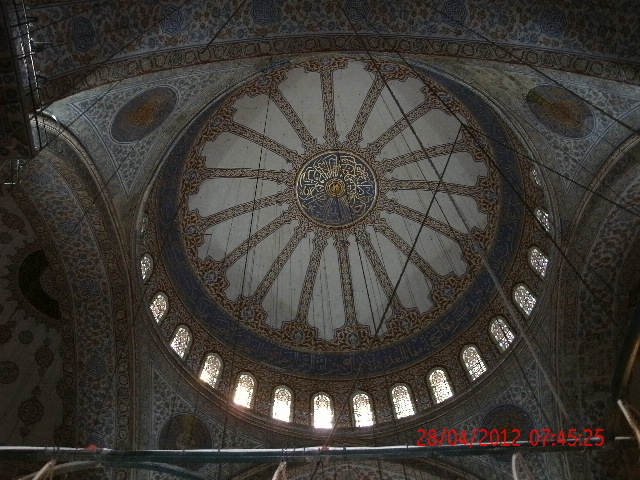 Then, nothing prepares you for the splendour and the grandeur of the interior of the Blue Mosque (so-called because of the mainly blue Ìznik tilework). 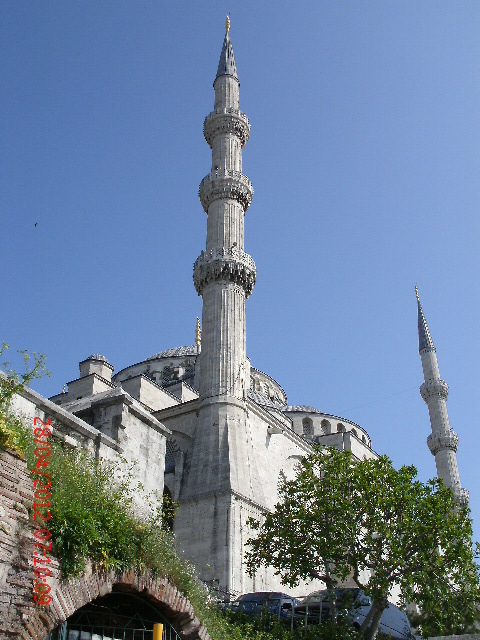 In fact, Nabil looked up and said a word which I abhor but in this case fitted perfectly – ‘Awesome!’ This magnificent mosque was built between 1609 and 1616 and its 6 minarets caused great controversy at the time because it was said to be a sacrilegious attempt to outdo Mecca. Still it is splendiferous! We walked around in awe on the carpeted floor just trying to take it in, taking photos which like photos of the Grand Canyon will never show what you are actually seeing the way you see it and feel it in real life. 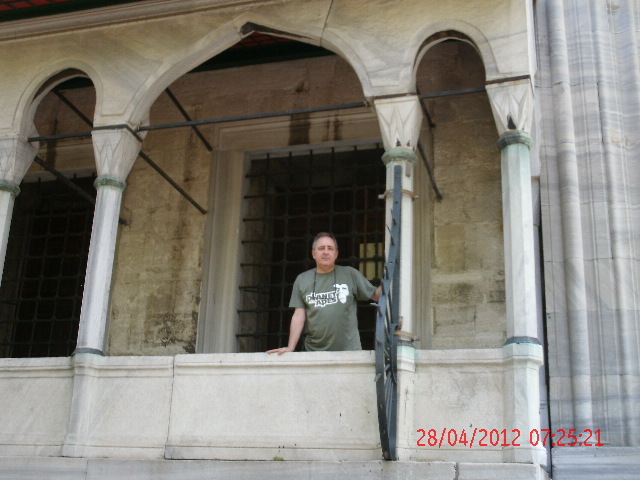 We spent about half an hour wandering the Blue Mosque and then headed across to the Hagia Sofia which was a just a few hundred yards away across Sultanhamet Square and past the Baths of Roxelana where we were to have a Hamam the very next day. This was a loooong queue and we didn’t know quite what to do at first because there were a few people queuing at a van for permits so, I asked a European-looking couple if we had to get a ticket here. They thought that you did but….. Anyway, I asked one of the guards at the front of the long queue but communicating wasn’t working so, I stopped a tour-guide and he said the queue at the van was for ‘season’ or as Nabil said maybe ‘citizen’ permits could be acquired. The weather was perfect – not too hot at about 70/75. Nabil got us an ice-cream which was delicious and finally after about an hour and half; maybe two hours we got to buy our ticket at 25 Turkish Lira (£8.60) each and enter the glory that was Hagia Sofia (Holy Wisdom). In ‘From Russia with Love’ it is called ‘St Sophia’. I took dozens of photos and thought I had found the spot where in the Tanya Romanova leaves the compact and to my surprise on watching the film on my return it was the right place! Well, I have been watching this and other Bond films since the mid-60’s. Yes, I am that old! So, something must have been ingrained on my memory. There was a lot more to see here than in the Blue Mosque so we wandered around looking at the place from every angle but I was also very tired. So, after about 2 hours wandering around this beautiful place we decided to leave and go for a drink and lunch. We found a lovely little bar perched above the main road and tram-line right next to Hagia Sofia and were lucky enough to get the only table in the shade as it was pretty warm now. We ordered 2 x Efes lagers and we were asked ‘Small, medium or large’ – well, we thought a large would be like a pint but it seemed huge when it arrived and in future we ordered medium – thank you ☺ I could hardly lift the glass!! We tried to return here the next day but it was teeming with people. Anyway, we ate and had our large lagers and then it was siesta time before we headed off toTaksim Square which was across the Galata Bridge across the Golden Horn (how fantastic does that sound and it doesn’t let you down with the view of all the mosques on the horizon). We were still to be on the European side even though we had crossed the water and we took a tram ride which was pretty efficient. We asked in the hotel about the best way of paying for our tram-rides because there are two types of travel-cards (like our Oyster card in London) but because we were there only a few days we decided to pay for each journey we took which cost 2 TL (70p) for each leg. You have to buy a ‘jeton’ (token) from the jeton machines before you can board the tram but this is all very easy-peasy. So, we bought 4 jetons each because we knew we had to take our tram from Sultanhamet to Kabatas and then a funicular to Taksim. The funicular was an underground one – that was a first for me! So, we spewed out intoTaksim Square which was wall-to-wall people. This was the young person’s area with gay bars a-plenty apparently. What I saw was this street that looked like Oxford Street with Christmas lights that was endless and packed to the gills with people seemingly going nowhere. The shops were all the shops you see at home as on Oxford Street. It was a bloody nightmare. It bothered me but not Nabil. We are very different people. He had wanted to meet up with someone there to show us around but after having a siesta (which never helps me – as if I am not irritable enough this makes me more so) I was ratty and all these wildebeest just pouring up and down this street was getting to me. Luckily we happened on a nice little quiet bar which just happened to be gay and we could sit outside so Nabil could have his cancer-sticks. We asked the bar man to recommend a restaurant but it sounded expensive so we decided to go in search of our own. We went round and round and round and finally found one which wasn’t half bad. So, having eaten we wondered what to do. I wanted to go home but I felt very guilty because I knew Nabil didn’t. So, we went back to the same gay bar which was getting busier by the minute. But, I don’t really do bars anymore and loud music and inhaling other people’s smoke either, so I said Nabil that I needed to go home to bed and would he mind. I said he could stay if he wanted. Well, that really went without saying. Anyway, being the good friend that he is he gave into me and we came back to the quiet of Sultanhamet but Taksim Squareis seared on my brain and I never want to go back there again!!!! We arranged a cruise for the next Sunday April 29th. It was a 2 ½ cruise that cost about 60 TL (£21) which included transfer from hotel and guide on boat who was lovely but very hard to understand and drinks and snacks on-board. It was a lovely boat and the weather and scenery perfect. We sailed along the Golden Horn towards the Black Sea along the Bosphorus and under the Bosphorus Bridge and returned along the Asian coast to Maiden’s Tower. Now, I had an interest in this because this was where Dame Judi Dench as ‘M’ in ‘The World Is Not Enough’ was imprisoned and underneath the tower Renard had the nuclear submarine. Well, luckily when we landed at Maiden’s Tower Dame Judi had escaped but I was very chuffed to have visited there. The views were stunning on this cruise and I would highly recommend it. 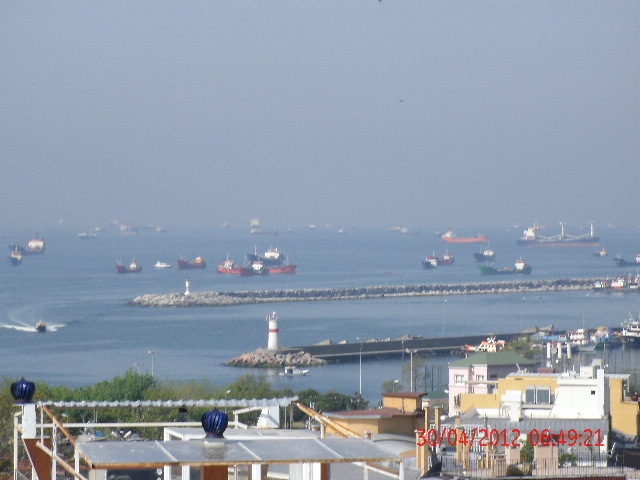 We did want to actually set foot on the Asian side of Istanbul but that is something for the next visit. We both agreed we would like to go back toIstanbul. So, we shall see what we shall see…..
At the end of the cruise we decided to disembark at Eminönü near Galata Bridgewhich we had crossed the night before in the tram. We had planned to come here to have af resh fish sandwich and a cold beer which we had heard about. So, Nabil had his fresh fish sandwich which was, I think 5 TL (£1.70) and then we went in search of the Spice Bazaar built in the early 17th Century and part of the New Mosque extension which was right next door. Another beautiful building. We had to take a tunnel under the road which was full of vendors and I stooped to buy some sunglasses which without bartering cost me 10 TL (£3.40) and I am still very pleased with them. But, there were so many people it was like a throw-back to the night before in Taksim. But, I made it through into the wonderful world of the Spice Bazaar. We didn’t buy anything here but tried some Turkish Delight (Lokum). The Turkish Delight I bought was from the Grand Bazaar! Then, I wanted to see another Bond location as I knew it was within walking distance. Again, from ‘From Russia with Love’ was Sirkeci Railway Station which was built in 1890 to receive the Orient Express and where James Bond and Tanya Romanova try to escape SMERSH with the Lektor. Then, our next stop which we had booked the previous day was a Hamam in those beautiful baths built by Süleyman the Magnificent’s power-hungry wife Roxelana in 1556. 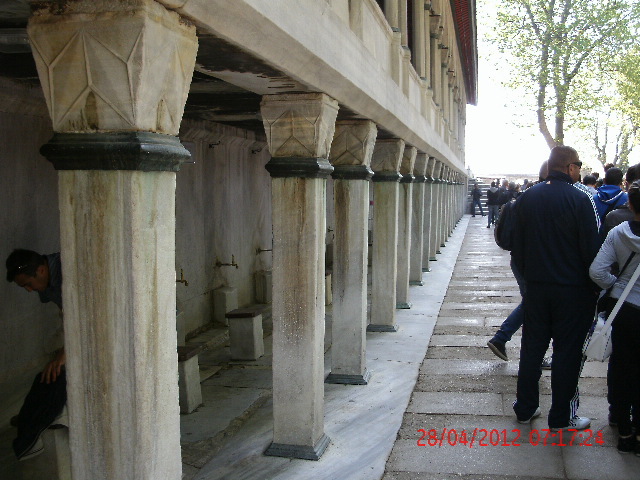 They were designed for use by the congregation of the Hagia Sophia when it was used as a mosque. This was an experience indeed. And, one I would like to repeat on a daily basis. One sits in a beautiful hot-room first and then taken for a cleansing and a massage like you will never experience and the surroundings are fantastic too. After leaving the Hamam and I still have my slippers; my exfoliating glove and the shampoo, etc we were greeted by the lovely site that is Hagia Sophia and I can tell you all the colours around us were just so much more vibrant – ha! Who needs drugs – just go for a Hamam. Anyway, we decided to go for an Efes and found the bar we had found the day before was full so we found a table next door to it (same staff; same kitchen) but no alcohol so, we left and went a place across the road which had a courtyard and comfortable settees and cushions. We sat here and the owner who became the only annoying person we met inIstanbul kept coming over to us; said he’d lived in London and even listed the northern part of the Northern Line stations to us. We only wanted a beer but had a look at the menu just in case for dinner but he became so obnoxious that place was right out. So, we had a warm Efes and then, I think went to Lokum (the bar we had visited the first evening) for a cold beer and I think a taste of Raki. Whilst sitting here we saw people eating and really fancied this huge dish of a mixture of meats and salad and even chips – I can’t remember its name now but I think I have a / some not very clear photos of it. Anyway, we returned to the hotel to change and dump our things and returned to Lokum that evening where there were what I thought were two annoying Antipodean ladies. They turned out to be the opposite; they were fromNew Zealand and sat next to us at dinner and lived in London and were lovely. They had been on a ‘pilgrimage’ to Gallipoli where they had slept outside on the beach with lots of other Kiwis and Aussies to celebrate an anniversary of a battle there. I only know Mel Gibson was in the film and he ran into the sea naked. Sorry my ignorance prevents me from being more exact than that but I am sure the anniversary could be Googled. But, they were indeed very entertaining ladies and I take back all my original negative thoughts about them before I actually met them. Monday April 30th was our last proper day and we had decided to go to the Grand Bazaar – again within walking distance of our hotel. What a place – it is exactly as you imagine it even more so – it was established way back in 1453. Now, this place is huge and vendors do not leave you alone….they ask where you are from; would you like this or would you like that – non-stop. Now, this seems nothing but after 5 hours it gets on your bloody nerves. And, you walk round and round and round in circles – it’s very easy to get lost – so take a map. Nabil was on a mission – he had to buy 3 or 4 leather jackets and this took most of the 5 hours because he was relentless in his bartering. Of course, being British I had to look the other way but admired the guts he had which I would never have. But, a fantastic place that I will never forget. I did pose at a water fountain at one point and then on re-watching ‘From Russia With Love’ saw 007 walk right past on his way to Kerim Bey’s place – so, I was happy I had been to another Bond location without even knowing it. 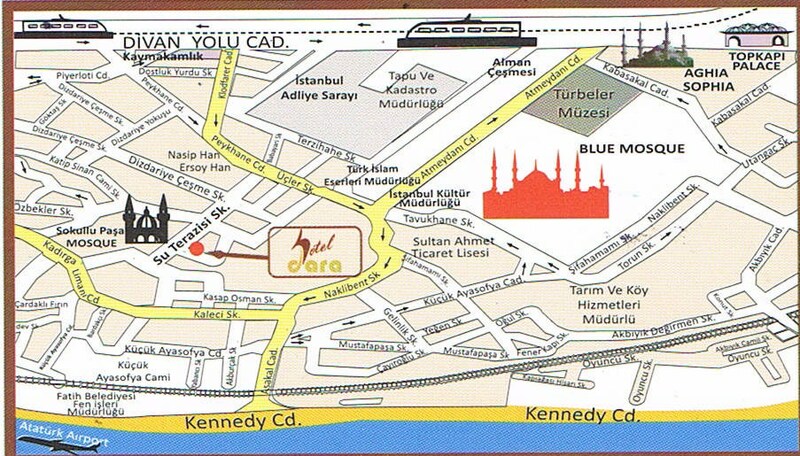 I had never even noticed that part of the film but I hadn’t been to the Grand Bazaar before. And, we had our first proper Turkish coffee here too very elegantly served too. After shopping which I hate at the best of times I negotiated with Nabil…..he said could we straight back to the hotel and drop off the stuff? I said I needed an Efes. He said he would rather go straight back to the hotel. I said that if he could hold off having a cigarette all the way to the hotel then that’s fine. I won. I had to have my fix too as well as he. So, we found a bar/ restaurant that had alcohol (not all serve it) and we sat in lovely place just people-watching for about an hour. Then, we returned to hotel and dumped our booty of leather jackets; Turkish Delight and cushion covers; ordered our taxi for the next day’s journey to the airport and out for din-dins. Where shall we choose? Decisions – Decisions. You must remember that when searching for a drink or a meal our surroundings were spectacular! 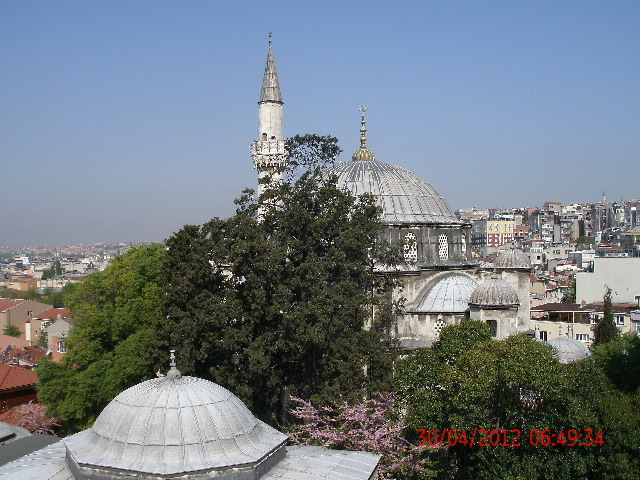 We would walk through the Hippodrome with the Blue Mosque and Hagia Sophia looming over us – wonderful! 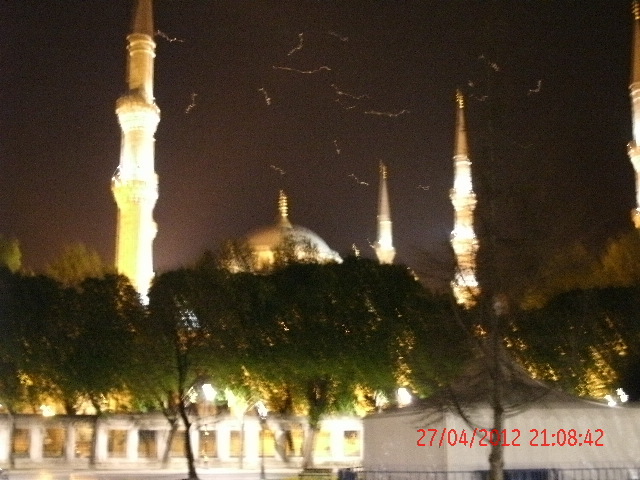 I even recorded the Blue Mosque whilst evening call to prayer/ prayers were being performed. Hopefully I can upload it here. 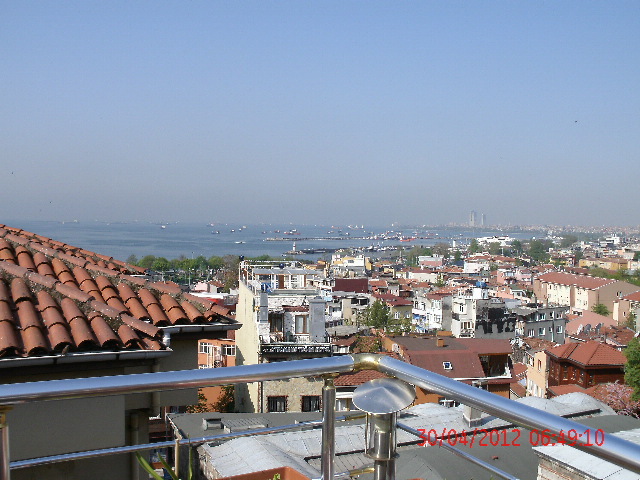 Maybe it won’t mean anything to you as it’s not your experience but it should be – make sure you go to Istanbul! After our last dinner which in my opinion was the best – I think I had Sea Bream – it was time to go back to the Dara Hotel and pack and be ready to leave the next morning. Not too early as that’s the way I had planned it – no early, early flights or late night ones either. We said our goodbyes to Aytac and Samra (gave them a TL 60 tip) and our taxi arrived on time and we were off! The journey back to Atatürk International Airportwas uneventful passing through typical city suburbs which are not as pretty as Sultanhamet but people have to live in the real world, I suppose. Our flight was on time and everything went smoothly. I managed to watch the end of the ‘We Bought a Zoo’ film on the way back. Lots of turbulence when landing at Heathrow which was scary as we seemed to be taking a long time getting on the ground. But this was right in the middle of all that rain that we experienced in the south-east and everywhere in the UK – we still are as I try and finish this report (June 8th). We went through the automated Passport Control (my first experience) and we were half-way home on the tube within 2 hours of landing – not bad. I decided to leave the tube at Knightsbridge and get a 137 bus but decided if a taxi appeared first I would take that and I was home in no time at all. All-in-all a 10 out of 10 experience. Only downside was the noisy room and the slightly obnoxious restaurant owner who said he had lived in London. Here’s to my next visit!!!!! PS: MORE IMAGES AND EDITS TO COME SHORTLY!!!! John, I am lucky enough to have been on the 007 soundstage…I shed a tear even though it just looked like a big empty hangar with Coke cans and crisp packets on the floor. I felt proud! Thanks I will have a read of your new review.